My guess is that it works both ways with the inky cap family. Gardens normally benefit from mycellium forming breaking down waste, forming complex networks, and delivering nutrients. However, when a inky cap dies it can kill nearby plants. Even edible inky caps like shaggy mane will eventually go to black mode when they age causing all the nearby plants will fall over. Fascinating tidbit. Are you sure it's true? I can't seem to find anything on the internet about the black goo killing plants (although I did just find one reference that shaggy inky caps kill a few nematodes.) Are you speaking from personal experience? How could you tell it was the mushroom killing the plants? Which specific plants were affected? Another site describing lawns being killed by fairy rings, but with a overall statement about mycelia being a good thing for your yard and rarely a cause for concern. Thanks for the followup! That's just what I wanted to know. It's a fascinating anecdote, but I'm not sure I buy it. With the amount of inky caps that end up in gardens on mulching straw, I can't imagine they are so dangerous to plants or there'd be more stories like that around. 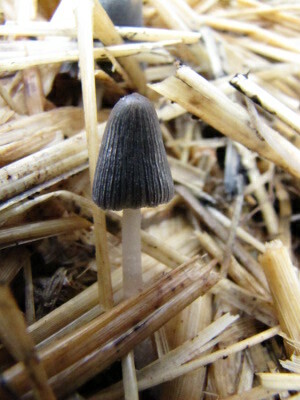 On the other hand, the inky cap species people find in straw are rarely shaggy caps, so maybe shaggy caps really do kill plants but the inky caps that grow in the garden don't. I'll have to keep my ears open for more stories! Are Inky Cap Mushrooms hallucinogenic or can I fry them up with some steak? There are several different species, so I hesitate to give you any information on the inky caps you might have in your yard. If I were you, I'd get two good edible mushroom books and make sure what you think you have matches the description in both books, then read what the books say about edibility. I've never eaten them, but have heard that at least one species is edible, but that it reacts badly with alcohol in your body, so you shouldn't eat it if you've had any alcoholic beverages lately. I can say without an absolute doubt these things have completely killed my plants in the garden I just started. I wasn't having this issue until I bought more dirt from lowes (Kellogg's organic garden soil). These things grow 4"-8" overnight and sometimes if I don't catch them in time I come home to the remnents (deflated stems and black goo all over the area). These have killed every seed that was growing to the point where I have to clear out the dirt and start fresh. I got the ink on the top of my hand when picking them out and the tops of my hands are also covered in a bumpy rash now. These are garden killers, end of story. This is my first attempt at the straw bale garden and my first year of going organic. My plants started out doing great, until my first inky caps appeared. I had bought some Black Velvet mushroom compost from Lowe's and applied it around my young seedlings to help them become established. When I first found the Inky Caps, I found maybe 6 or 7 and ripped them out, straw and all, and threw them away. All the researching I did said they were okay and not to worry, because it just meant I had a lot of organic matter in my straw bales. Well, a month later and I have inky caps coming up in 10 - 40+ at a time, two to four times a day, right around base of plants. When the caps come up or fall on a plant, wherever it is touching the plant, that part of the plant withers and dies. It is non selective at to what the plant may be. I've lost numerous tomatoes, peppers, cantaloupes, squash, etc. I have never seen anything grow as fast as these things do. I have tried to pull them out, cover with newspaper and cardboard, but to no avail. They grew to full maturity under the cardboard and newspaper. I have since read that since they are a fungus, I can try a fungicide to try and get rid of them. I am at a loss of what to do, other than try an organic fungicide. I'm not at all happy with the Black Velvet mushroom compost from Lowe's. It would have been nice to know this may happen, if applied to a garden area, before finding out the hard way. 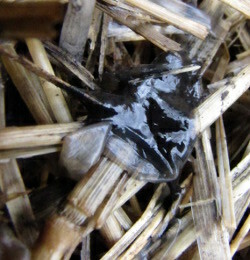 I have this compost all over the tops of my straw bales, with no way of getting it off. I can't replant, because they are so numerous and fast growing. They would just kill any new plants I put in there. Very discouraged right now. 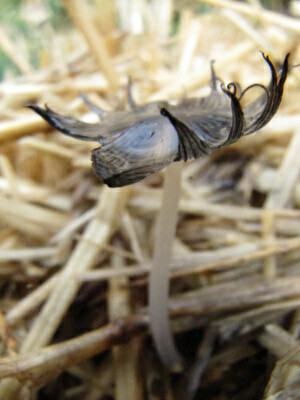 I just hope I can find a remedy, before I lose my whole garden to these invasive, plant killing, Inky Cap Mushrooms!! If anyone can help me with this, I would be very grateful. God bless an I hope you have a great gardening day! My apologies to Black Cow & Lowe's. I have found out the inky caps did not come from any item from Lowe's. They came from the straw bales I had purchased for my Strawbale Garden. After purchasing more bales, I had set them out to condition them, but never applied any compost, fertilizer, nor anything else to them. It has been raining nearly every day, for the past two weeks. Yesterday I noticed inky caps coming from under the coverings I had on them. So, I knew I had to come back and repost the truth. I have also noticed all the bales are full of chiggers! Thank God for Diatomaceous Earth! Of course, I do stand firm that, in my garden, these "Inky Cap Mushrooms" killed every plant they touched with their tops! You mentioned thank God for DE,why? Does DE kill the inkys? This is my fifth year of straw bale gardening and have never had inkys that won't stop growing and killing everything. Please help.